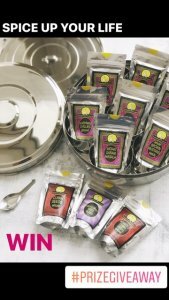 Every Indian household will have one of these spice boxes. As a thank you for all the follows and likes over the last few months Chet over @chilliesandcloves is holding a competition on Instagram to show her appreciation. 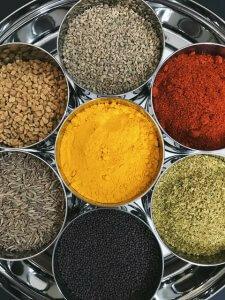 Chet has partnered with us @seasonedpioneers and you will have the chance to win this beautiful spice box, with 10 of Chet’s favourite spices including our fabulous Fish Curry spice and our Indian Garam Masala spice. To entre all you have to do is go over to Instagram and like this picture and follow both @chilliesandcloves and @seasonedpioneers Also don’t forget to tag a friend who you think could do with some spice in their life. If you win the friend you tag could also win 3 fabulous spices. You can tag more than one friend just be sure to do it in separate comment boxes. Good Luck. Competition Rules: Closing date Friday 15th September 9am, open to UK residents only, over 18s only, In order to comply with the rules you must have followed both accounts and liked the picture above. Winner will be announced 12pm Friday 15th September. Winner will be randomly picked by a third party.